Have fun, be safe - every time you go out! 1. Before You Boat, Make Sure You Float! The best life jacket is the one you will wear! Have it on when the boat is underway or readily accessible in case of an emergency. When do life jackets save lives? A wearable life jacket can save your life, but only if you wear it. Throwable devices must be immediately available for use. 2. Attend a Vessel Safety Check! Be sure to attend the Vessel Safety Check each June on Manchaug Pond sponsored by the Manchaug Pond Foundation in cooperation with a certified examiner from the Green Bay Sail & Power Squadron. Besides your boat sticker and checklist, pick up a free hard copy of the Massachusetts Boating Handbook and other educational information and safety items. Free and open to all. 3. Take a Boating Course! BOAT MASSACHUSETTS is a state and nationally approved boating safety course, concentrating on the equipment and operating guidelines needed to enjoy boating in a safe and responsible way. The course runs 10-12 hours in length. The normal format is 5-6 two hours classes, though this may vary. All classes are free of charge. Classes are for adults and youth 12 years of age and older. Family participation is encouraged and has proven to be very rewarding. For the free online study course and test preparation, for course dates check online, or call the Massachusetts Environmental Police at 508-564-4961. Watch for hazards: the rocky shore, the shallow channel, the submerged channel wall, and submerged Blueberry Island. STAY to the CENTER between the red CHANNEL signs! No Wake Zone and Nothing in Tow through the channel: DO NOT pull skiers or recreational tubes! When the lake is busy, maintain a COUNTER CLOCK-WISE direction of travel (when facing north) to maximize safety. Manchaug Pond is regularly patrolled during the boating season by the Sutton Boat Patrol and the Massachusetts Environmental Police. Additionally, the state public access ramp is patrolled by the town, state and environmental police with safety inspections performed before boaters get on the water. If you are approached by the police/police boat, please stop and allow the officers to speak with you – they are known to “conduct inspections, investigations, render aid to disabled boats and inform boaters of basic boating practices.” Their goal is to educate and ensure the safety of all residents and visitors enjoying the waterway. get the vessel ID numbers. AGE RESTRICTIONS: No person under 12 years of age may operate a motorboat, unless accompanied on-board and directly supervised by a competent person 18 years of age or older. Personal watercraft (PWC) users must still be at least 16 years of age in order to operate, with no exceptions. Safety Education Certification: Youth who are between 12 and 15 years of age must complete an approved basic boating course in order to operate a motorboat without adult supervision. Upon successful completion of such a course, students are issued a state “boating safety certificate” which must be in the possession of the certified operator when underway. Personal watercraft users who are 16 or 17 years of age must also complete such a boating course. Youth less than 16 years of age are not allowed to operate personal watercraft. SAFETY EQUIPMENT: Most of the state equipment carriage requirements are similar to federal laws. This primary list includes life preservers, fire extinguishers, signaling devices, visual distress signals, and navigation lights. waterskiers, always; canoeists/kayakers from September 15 – May 15. A boat owner or a boat’s operator is responsible to ensure that passengers on-board wear life preservers as required. All motorboats (with the exception of personal watercraft) be equipped with an anchor, manual bailer, and line. 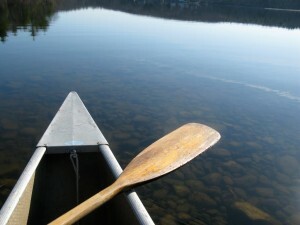 A paddle or an oar is required on boats less than 16 feet in length. Motorboats towing skiers must also be equipped with a boarding ladder. Registration and numbering of all boats powered by machinery is required. In BLOCK lettering only. Operating any vessel under the influence of alcohol or drugs. A blood alcohol concentration of .08 BAC is the current standard of intoxication in Massachusetts. Penalties have increased substantially and may include the loss of a motor vehicle driver’s license. Operating at an excessive speed considering weather conditions, boat traffic, and other hazards. For inland waters, operating at a speed greater than 45 mph is considered negligent operation. Operating at greater than headway speed (6 mph or less) within 150 feet of a swimmer, waterskier, mooring area, marina, boat launch, or when the operator’s vision is obscured in any way. Life jackets required when canoeing and kayaking from September 15th – May 15th. This is only a summary of boating laws. All boaters must know and observe all local, state, and federal laws. For further information on boating laws, boating education, or to obtain accident report forms contact the Massachusetts Environmental Police at (508) 564-4961. BOAT SMART FROM THE START- WEAR YOUR LIFE JACKET!